The whole dish, prior to baking. Ok, I would like to promise that this will be my last post with the almond feta for awhile, but I can't guarantee that! It's just so good, and so versatile :-) This dish is particularly fantastic - jumbo pasta shells stuffed with the almond feta mixed with lots of fresh basil and all topped with my new favourite tomato cream sauce (blog post below). Seriously delicious and really special, I can see us having this one for many special occasions....or any weeknight really as it's not hard! I realize my quantities may look skimpy but this was very satisfying with just the right amount of filling and sauce. I went with 4 shells per person but this recipe could easily serve just 2 with 6 shells each; just keep in mind that almond cheese stuffed inside pasta with a cream sauce does have the calories you would expect! In the morning make the almond feta up to the stage where it is draining in the cheesecloth in the fridge. I also like to make the sauce in the morning and have it ready and waiting in the fridge. About an hour before you want to eat remove the feta from the cheesecloth and place in a lightly greased oven proof dish. Bake at 200C for 20 minutes. It usually takes 40 but remove it now and stir in lots of chopped fresh basil, it will be quite soft. Now the shells, it will depend on what the package instructions say but I parboiled mine for 15 minutes then ran them under cold water and drained well. 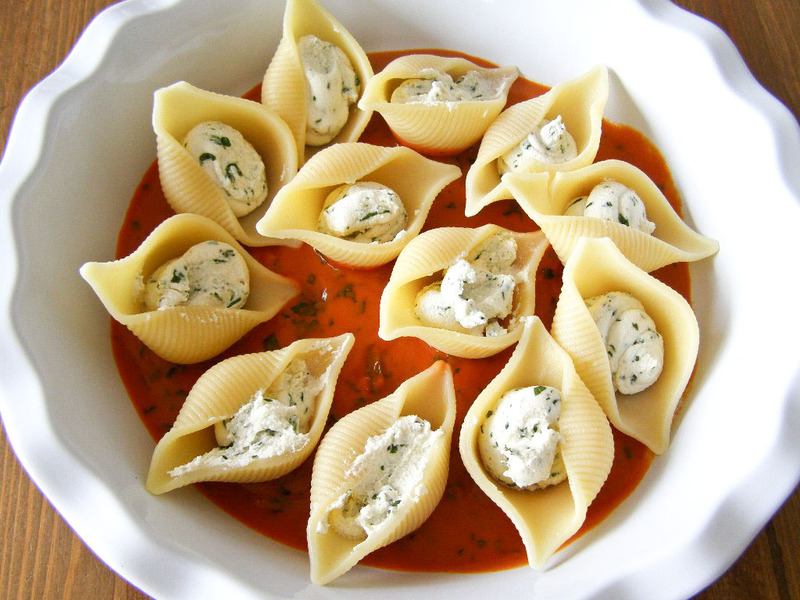 Stuff the shells with a bit of the basil feta but don't fill them up or worry about fully fulling them up. The basil feta is strong in flavour (as well as calories) and you don't need a lot here. Also, I filled a piping bag with the cheese and piped it into the shells but don't recommend doing that. It was fiddly and would have been much easier to spoon it in. 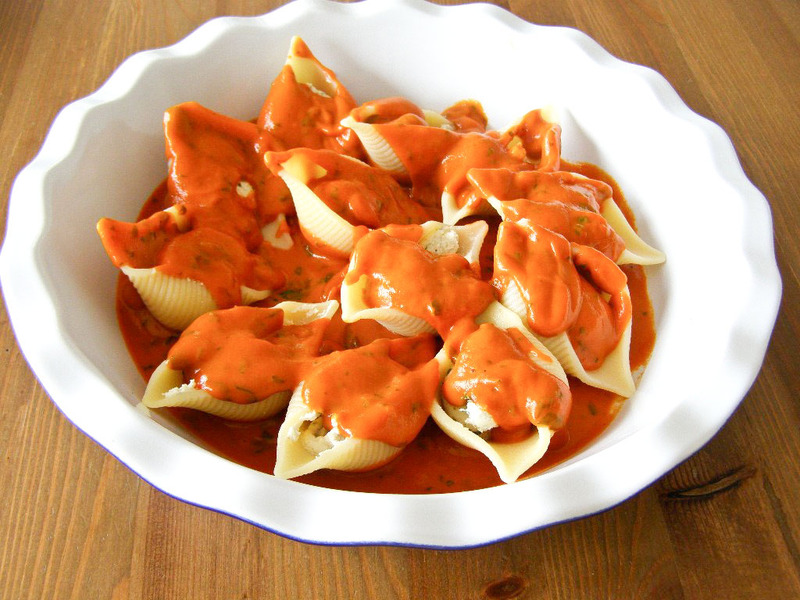 When the amount of shells you want are stuffed heat up the tomato cream sauce and stir in some chopped fresh basil into the sauce. 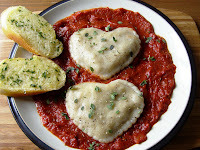 Now place some of the sauce in the bottom of an ovenproof dish and lay the stuffed shells on top. Now, fully cover the whole dish with foil and pop back into the 200C oven for 20 minutes. My shells after this stage where just al dente but could have maybe done with a little more so give them a little test and see if they need a little longer in the oven. 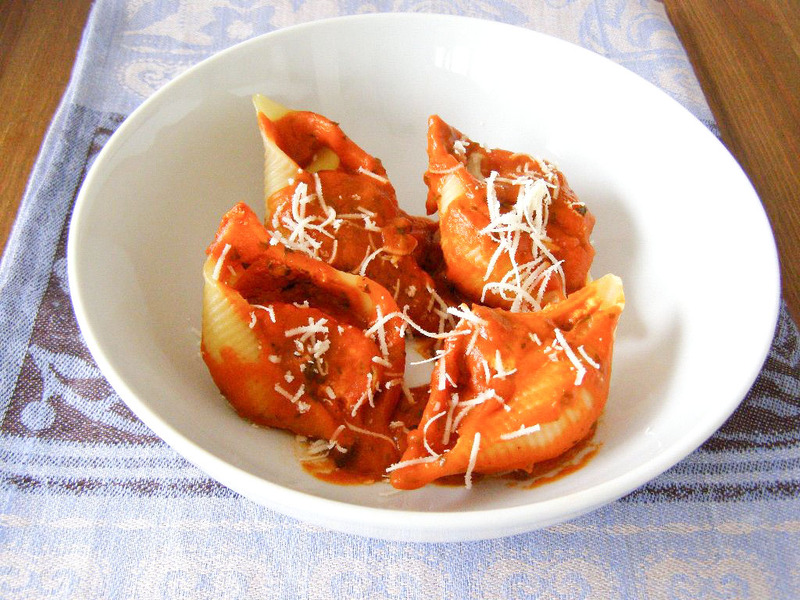 Scoop out the shells onto a plate and this is entirely optional - grate with a little cheddar cheezly and serve. Would be great with a glass of red wine and garlic bread. The finished dish with my *smaller* portion plated up, shame it's not a great picture as this was amazing!! Your food always looks so beautiful! And there can never be too much talk about almond feta. mmm, I just made the almond feta again today, this times with lots of chopped chives in it, yum! I keep on making the cheese. Earlier I had tried the spanakopita with excellent results and now this out of this world baked pasta. I did not get jumbo shells and had to do with large sized rigatoni( it is tedious). I added some veg stock I had since I did not have passata and used tomato paste and had to thin it down. The result was excellent and yes it is so difficult to stop eating the pasta!! 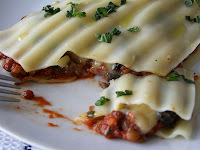 I love your site and your no-fuss recipes and the beautiful photos. Keep going. Previously I also tried your sesame puff pastry croutons and it was a huge hit with my guests. Thanks so much for your lovely comment Samarpita ♥ So glad you liked this and other recipes here! Just had the cheese for lunch, im in LOVE ♥ So amazing. Its made my day :D Cant wait to share it :) I love the idea of putting ground nuts in pasta sauce for the creamy factor too, fantastic. Glad you liked it Tash!